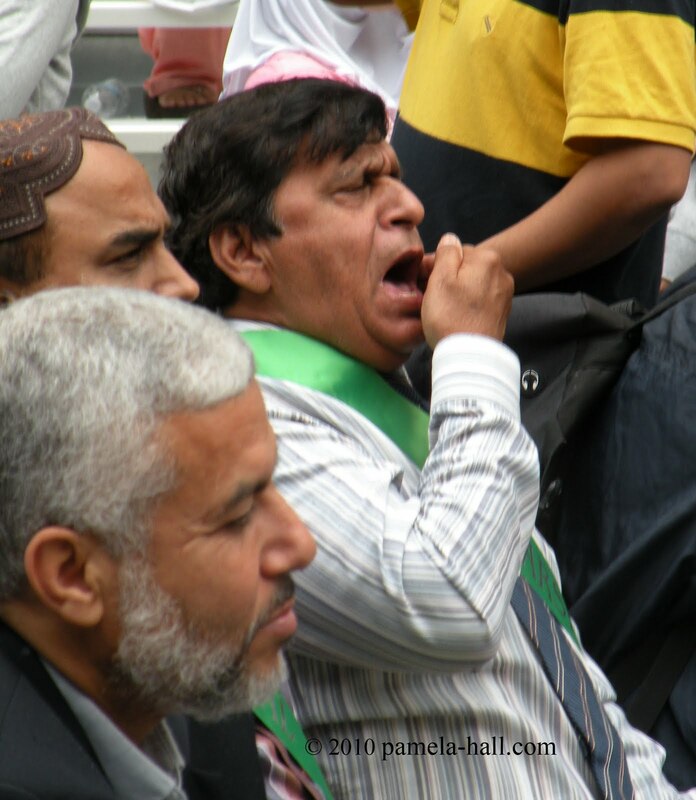 Photo Essay compares 25th Annual Muslim Day Parade with previous years & a look ahead… | the "silent" majority no more! 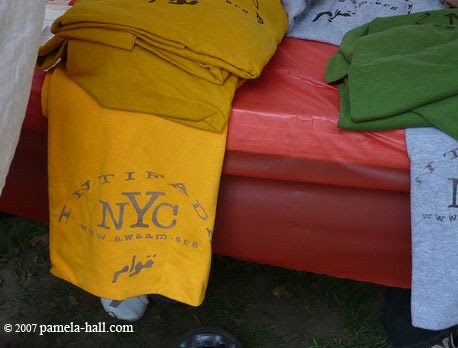 Twenty Five years of the Annual Muslim Day Parade in New York City. TWENTY FIVE YEARS! Shouldn’t they be CELEBRATING? Why are they complaining? Each year the confidence of the Muslim community has grown….even if they pretend otherwise…it has grown. Yet they snuck this anniversary year in under the radar. No theme announced as usual (which appears to be da’wah) and there was confusion caused by announcing their as 41st street but actually setting up at 38th (even the police seemed a bit confused). They assembled at 38th (not 41st) and waited for traffic to be shut down…. The lovely golden gown, is a man. Couldn’t place what culture that attire represents. Guess the red hair is the same as a red beard? All was calm. So calm, they even added a Wudu basin this year. A BOLD addition, which can be seen in the distance in our parade video but we are most thankful to Urban Infidel for this picture. The police and the parade participants all were VERY relaxed. Not that they were tense in the past years, but their attitude this year was definitely laid-back (except for the flurry of anxiety begging the police to close the intersection to traffic. They were on-the-clock for their zuhr mid-day prayers). Even so, there was lots of waiting…. Everyone continues to wait calmly while a big communal display was made of laying-out the prayer-tarps (finally). This young lady-in pink, however, does NOT look happy. And then, the actual prayers. (almost). First we heard lots of “brothers and sisters” and “insha’allah’s” while they kept being instructed and corrected on how to form a straight line! The separation of the women and the men. For the “Brothers and Sisters” (Insha’allah) that’s quite a divide…. 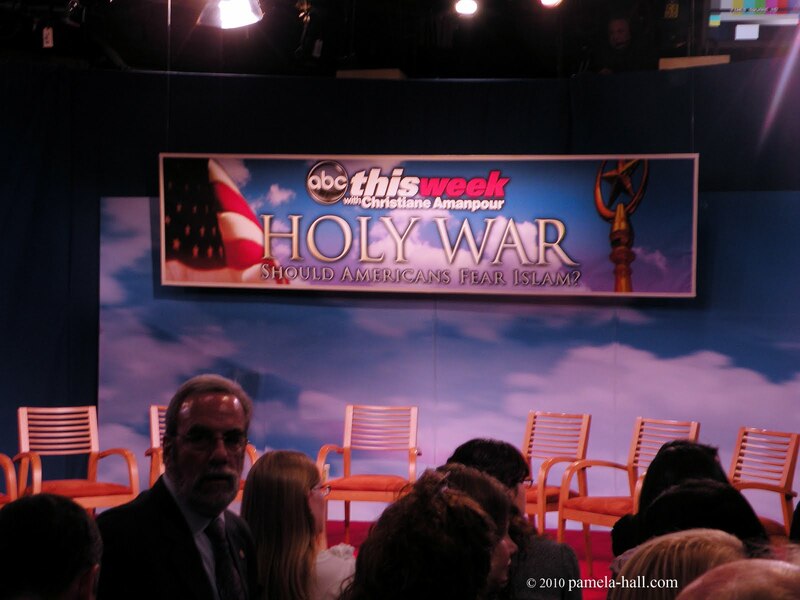 After the “Warm and Fuzzy” prayers…. The “Warm and Fuzzy” Parade (except for some of those more militant chants) which you can see and HEAR in the next two videos (Parts 6 and 7 are the parade) . Followed by the Police Marching Band playing, as always: “This Is My Country”. The RELIGIOUS Floats return each year. Do we have any major parade in Manhattan that’s comparable ? So boldly religious? Can’t think of any. 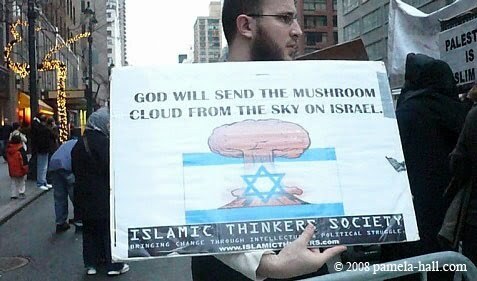 The religious theme continued in their signs with many peace-loving quotes from that “warm and fuzzy” guy: Muhammad. 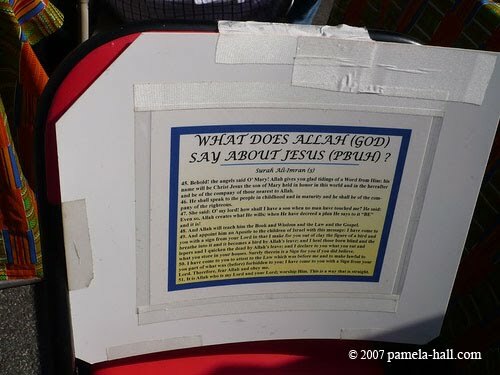 But, there were, also, the political statements from the younger marchers in this religiously, political parade. With much thanking of Obama along with chants of “We are the Muslims.The Mighty, Mighty Muslims” Definitely a religious/political event. Always many banners of schools march in the parade…. Some of these girls sure looked like the Catholic nuns of old. Mayor Bloomberg did NOT co-operate this year when it came to the familiar push to add Muslim Religious Holidays to the school calendar. 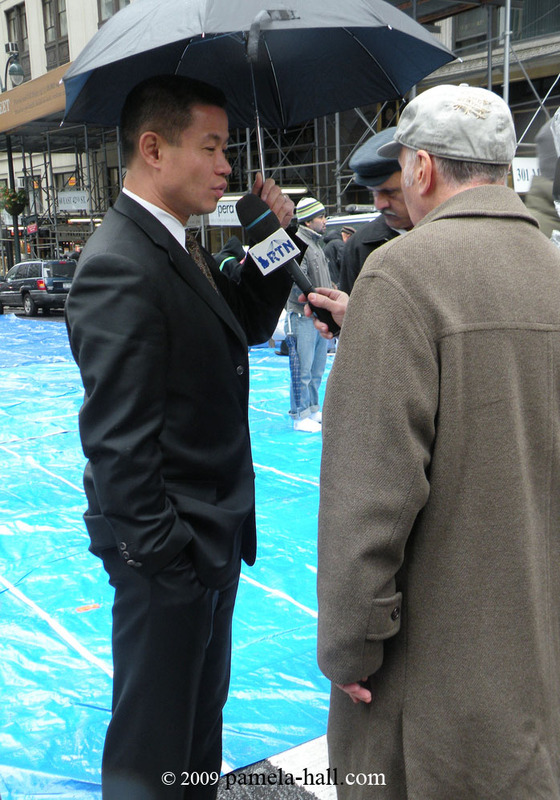 Yet, the ‘honorable’ Mayor Bloomberg still managed to be thanked ….over and over… in the speech/lectures at parade’s end. Part 7 is also video is of the parade as it continued down Madison Avenue to Madison Square Park. And at the stage, there was a “one-man-band” who screamed “takbir, takbir, takbir” in every open space he could find. Before and after the speech/lectures, book-ending speeches and songs , he never let-up yet he never lost his voice! And those speaker/lecturers, they stayed ‘on-message’ . Team-work, so we got lots of whining about being victims of racist, islamophobic, bigots. During the introductions, the MC kept requesting different leaders of the community to come to the stage. On film, we happened to catch one woman interrupting the MC with, “Where are the women? Where are the women leaders.” She seemed to be getting no response so she added, “Keep that in mind. Where are the women”. 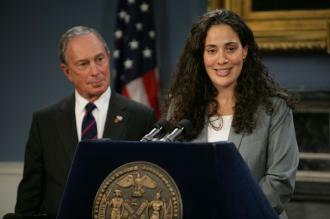 Fatima Shama – Mayor Bloomberg’s Office of Immigrant Affairs. As Commissioner of the Mayor’s Office of Immigrant Affairs, Commissioner Shama currently serves as Senior Education Policy Advisor in the Mayor’s Office, where she previously served as the Health Literacy and Language Access Coordinator. And ‘WHERE OH WHERE’ was the Workers Party, Margaret Chin (who so recently accused her consituents of being islamaphobic-racist- bigots.) Now she’s shy? Feinberg (with umbrella) was having a much BETTER day in 2009…..
Was it easier to whine and play the victim with their dhimmi-politicians missing? No matter, they did make sure that they offered-up the requisite dhimmi-Priest, an even MORE dhimmifide -Rabbi and, “The Imam”. What was unique to this year’s parade? This year, most families came dressed in their cultural finery. It was quite lovely at times. The theme? The fashionable, pretty women; the lovely sweet children. Cultural Pride? Diversity. Muslim Pride? But, then we come back to OUTREACH . Da’wah. There is nothing to fear. Join us. We are all ONE. Apparently, the families did have one complaint. They kept asking for the childrens’ activities. The MC responded more than once saying soon…be patient….But the speech/lectures went on-and-on and ON. The families weren’t expecting all these media-directed speeches/lectures. But, the messages were aimed at them, too, NOT just the media. The repetition about victim-hood, alluding to fear. Urging them to BE AFRAID of those racist, bigoted Americans. FACT: The number of Muslims living in the New York City is growing. They live here as freely as anyone else in America. Certainly freer than they do in their Muslim countries of origin , forced to live under Sharia Law. As Americans, the average Muslim family may not care about politics-as -usual but their college-aged 20-somethings do. They are VERY political thanks to CAIR, ICNA, MAS, the Muslim Brotherhood. All work hard at indoctrinating the children and the youth (the next generation) They need them as the next wave, to be LEADERS in their/our communities. The speaker/lecturers encouraged the audience to “ Make a CHANGE.” They want the adults to “Get Involved”. To show everyone what it means to be a Muslim. To vote. To become media savvy so they can control the message. To ‘assimilate’. I do NOT see the victims they claim to be. 2007 was the first year I saw the parade. 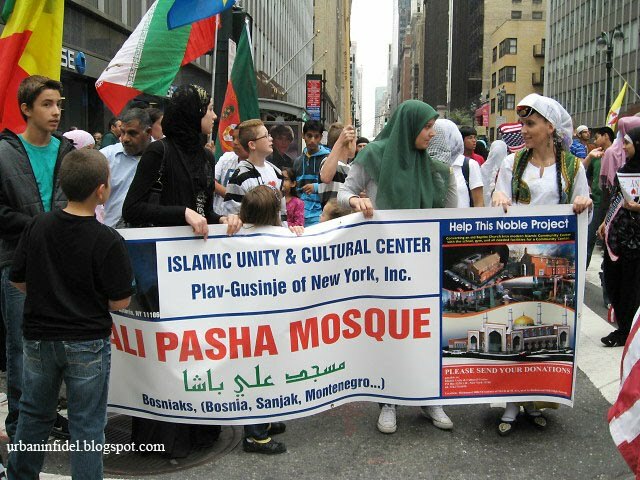 It was on September 9, 2007 , The 22nd Annual Muslim Day Parade. 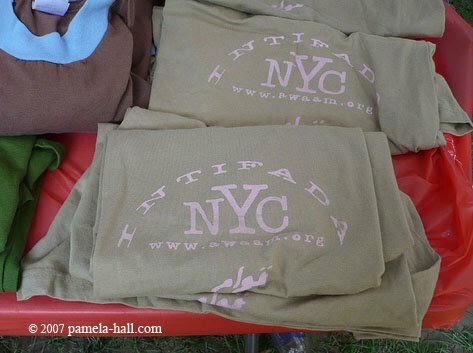 2007 was, also, the year we discovered the NYC Intifada t-shirt and questioned what textbooks were to be used at the newly announced Brooklyn Arabic language school, Kahlil Gibran International Academy.. The Khalil Gibran International Academy (a public school with an all Imam advisory board) left many FOIA (Freedom of Information Act) questions unanswered. But, the American public experienced a “Great Awakening” ; no longer willing to accept the obfuscation that surrounded this public school.WE FOUGHT BACK. In 2007 there were many people who came out to protest the Annual Muslim Day Parade. (perhaps it was the first protest against the parade) The protestors lined up at 25th and Madison to the surprise of many and added to this public protest were the very angry and threatening Revolution Muslims. 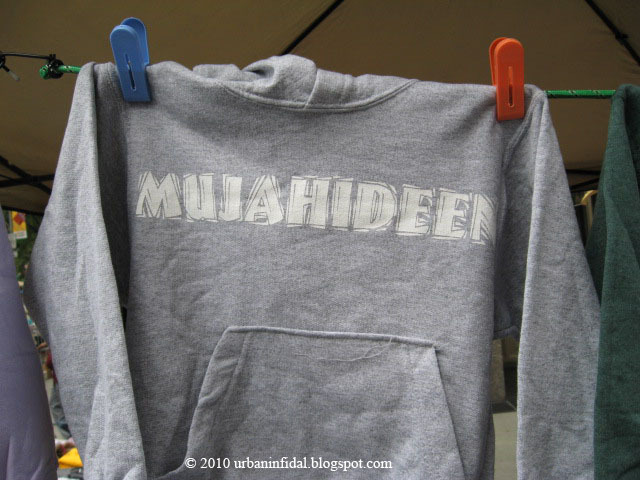 (BTW- In 2008 we took this now well-known picture of the “Jersey Jihadi”. 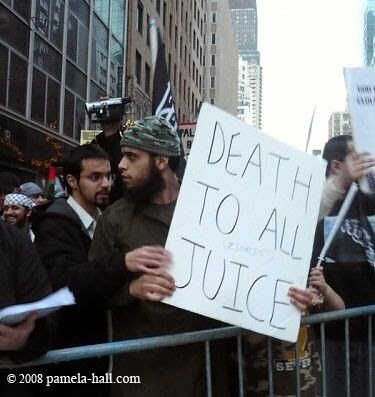 The “Death to all Juice ” guy, Carlos Almonte, while he hung with the Revo-Muzzies in front of the Israeli Consulate). The Revolution Muslims…. are NOT a “Warm and Fuzzy” group of Muslims. Back to 2007 which was only 6 years after the murders at Ground Zero by Muslim Jihadis and yet hate-groups like the Revolution Muslims, these militant Jew-hating Muslims were on the corner of 26th and Madison preaching racist, bigoted hatred of AMERICA,protected by their Constitutional Right to Free-Speech. 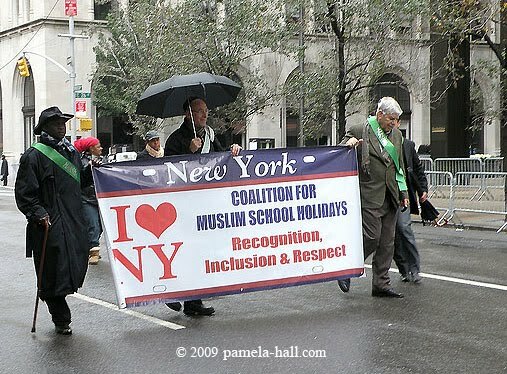 We understand the dates of the Muslim Day Parade had been consistent for years, but after the 2007 parade the dates began to float; perhaps because of the protests of 2007? So on October 12, 2008 , the date on which Muslim Jihadists attacked the USS Cole, an American ship in Yemen and murdered American sailors…. 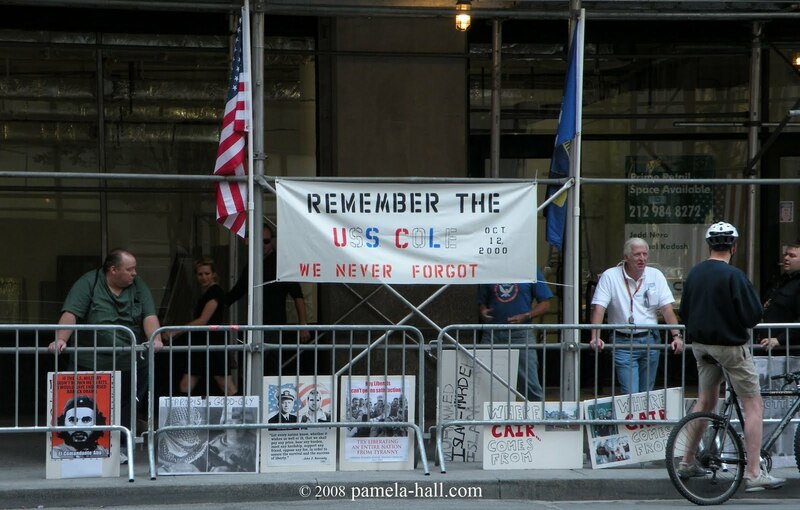 on this date they chose to hold the 23rd Annual Muslim Day Parade with no mention of the USS Cole . Both years, 2007 and 2008, the Revolution Muslims spoke out aggressively to all who passed-by, but even more boldly in 2008 when they came-over to our-side, to a group of women and started a confrontation. It was most unusual that the police ignored them, but they showed little interest in sending the Revo-Muzzies back across the street until one of ours threw COFFEE on the lead instigators! 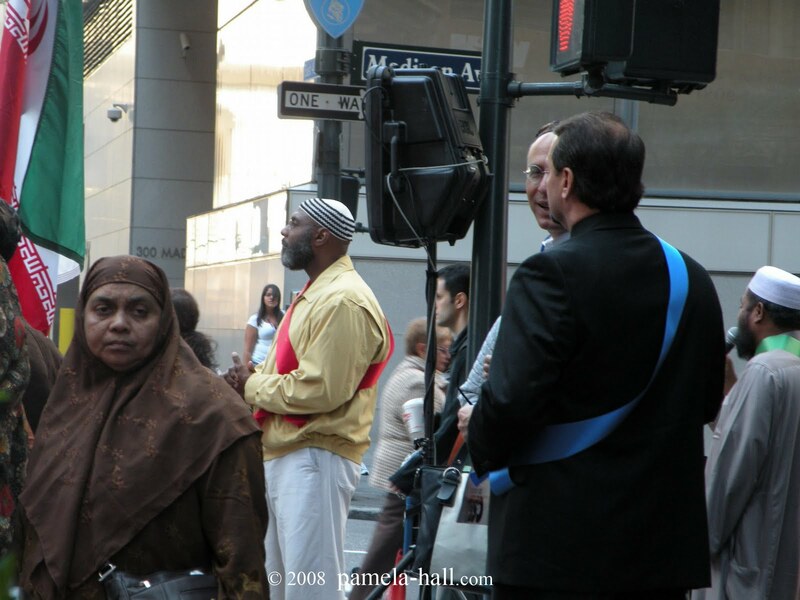 October 18, 2009 was the 24th Annual Muslim Day Parade. Their annual parade was held with no protests. A little rain but it seems everyone who protested on 2007 and 2008 lost interest. This year the vile Revolution Muslims are IN the parade. (without incident) The parade went off without a hitch as it had even during the two protest years. The CENSUS was the theme in 2009. The pressure to be counted in the wake of the ACORN fraud was an unfortunate theme. But, the press let that slide so… who knew? This year I was told, by the police, to stop taking pictures of the set-up for prayers. I was making the Muslims nervous. I was intruding on their privacy; making them, their families, nervous. At a PARADE?! 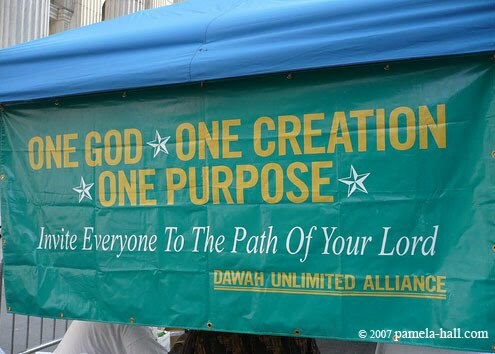 This parade has one goal only, year after year: To encourage the trust of the America public in all things Muslim. Simon Deng and the Sudan. Slavery. Children torn from their families. Murder. Torture. In the 21st Century! Iran. Islam has been destroying the Persian culture and it’s history for centuries The mullahs and Ah’jad have imprisoned an entire country. Tortured and murdered by the thought-police. The Islamists strive to destroy the Jews, to destroy Israel (even the displaced peoples of Trans-Jordan) ALL are victims of Islam. Islam has terrorized the Hindus, Sikhs and Buddhists and Pakistan. Islam. A country born on the wings of genocide.Working to tearing India and its culture apart. France, England,Denmark .The Netherlands . EUROPE is waving a red-flag , warning us of Sharia. “Submission” is blowing in the wind States-Side. The Ground Zero Mosque and the sobering confidence of Sharia Law proponents Daisy Kahn and Imam Rauf . They claim that Sharia Law is already in our Constitution. they ask why do we think Sharia no place in our country? It’s HERE. NEVER FORGET the suffering of those murdered on 9-11 in the name of Islam and those who have suffered and continue to suffer in Egypt: The Coptic Christians, and in Greece : The Orthodox and The Armenians. In 2010, as I watched the people from Azerbijan/Boznia march-by (and whose children sang so sweetly on the stage) there was an obvious cultural question to be asked. These were not a people who would have chosen to be Muslim. It was not their culture. This was conversion by sword. Is this is our future (by stealth or by sword) if we don’t FIGHT BACK? 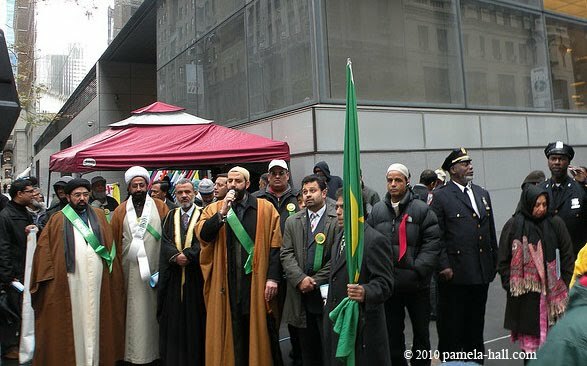 Will next year’s “26th Annual Muslim Day Parade” have even more significance with the groundbreaking of the “Victory Ground Zero/Cordoba Initiative/Park51 Mosque” ? Will 2011 mark the end of the 10 year HUDNA? Will that be the year Islam claims VICTORY? Our media is suckered, our government is suckered; eager shills for the Islamists. 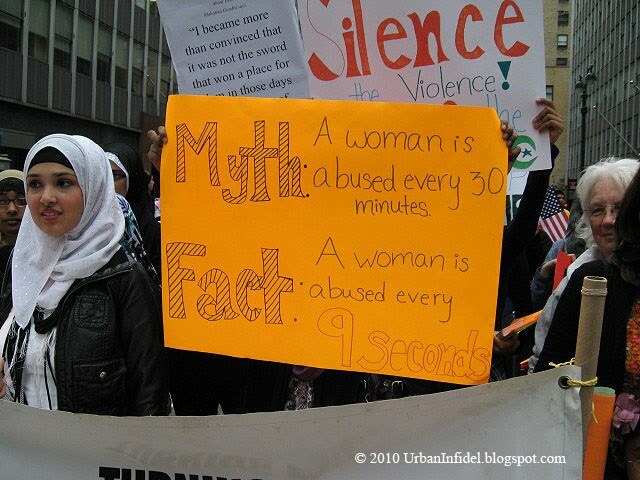 CAIR, MAS, ICNA, these are organizations with a verifiable history of supporting violence .Yet, the parade, our government and the media accept them as peace-loving and deny the horrors of Sharia Law and forced-conversions of Islam. We have a duty to protect our freedoms for our children and our childrens’ children as promised by our Constitution. We must FIGHT BACK without apology or we become Europe. Foot Note: Robert Spencer has a detailed report of Amanpour’s very BIASED program. And, from the same program, an Atlas Shrugs has an updated report.